These wind drip drawings were made 8 years ago on this very same clothes-line. Then the sheets of cotton lay on the ground and little paper vessels that I made by stitching old bank statement held the indigo pigment and oil that dripped as the wind blew them dangling from the clothes line. It was a nice circle to hang them from the same clothesline but this time let them be blown by the wind and dance! I loved the sound they made and the meditative feeling you get from watching the repetitive but ever changing motion as the wind blows the wind dripped drawings; a little dance making the invisible visible. The cotton moving backwards and forwards and the sound it made reminded me of a Public Art Piece that an Artist and Friend of mine Maeve Collins did in the Square in Ennistymon last summer. Maeve hung some real and elegant bed sheets with mirrors attached reflecting what was happening in the space around them, as they moved backwards and forwards on the sheets, while at the same time played recordings of elderly people talking about life on the island, which Maeve recorded while living on Inisheer. It was a lovely piece the Artist sat with her work to talk with anyone who wished to converse beside the meditative wave of the sheets that had been brought into the town. This is just a snippet as there is a lot more to Maeve’s work that I did not mention. As part of this Public Art Work her recordings also sailed over the waves to the Aran Islands and there was a third part to this work, a line holding clocks, umbrellas a dress and musical instruments entered the sea at Liscannor, and the gateway to HiBrasil, an island some people say they have seen. I hope to put up some of the Artist’s images of this poetic art work soon, as I am having a little technical trouble today. So have a look in a few days they are well worth it! If it is not right for you it is not right for the world! Inspiration and influence can come from all sorts of places; it could come from everything we experience. Maybe we should be a bit more particular about what we experience? I think that what we look at and what we read does go in, and even helps shape who we are. This is why media controls the world, well certainly has a huge impact on it, and now the Internet is changing the world; because it is coming from millions of individual sources. Saying this Google knows so much about everyone, whoops I better stop now! I think of artists being like digesters and distillers of everything that we witness; it is munched and mulched and then played with to create something original. A large part of an artists job is to witness that which my inspire and lead to interesting art being created. 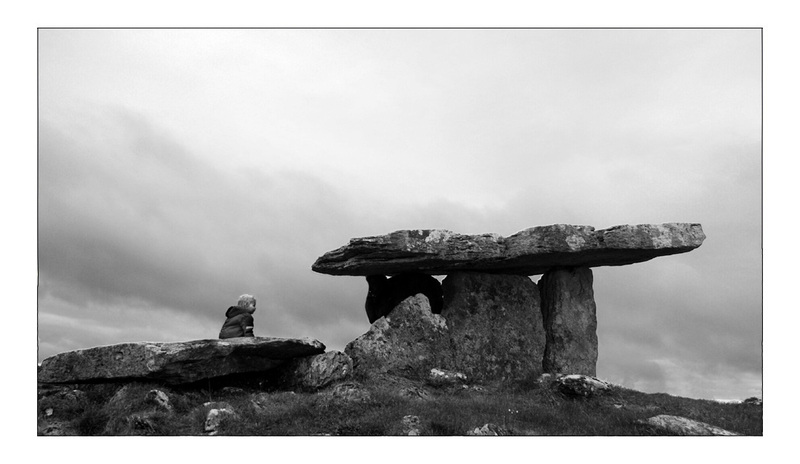 This morning we all loaded into the car, off to see a Dolmen. I wonder what they were for, there are so many around the Burren. I have only visited a couple so far but each one has felt very special, and I would not be surprised if the people then, knew far more than we do about the earth and energies in it. For me Dolmens symbolise a connection with the earth and the spiritual; enclosing a small piece of sky within large rocks that usually lay close to the earth; the earth and the sky becoming intertwined. For me this part of the world is very mystical, maybe because we are in the clouds most of the time! Or maybe Liscannor really is the gate way to Hy-Brasil (Read more about this and an art piece by Maeve Collins, in another post to come.) I was very glad James suggested we jump in the car and go to see the Dolmen.